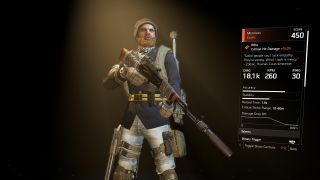 Get The Division 2's exotic rifle, Merciless, with our guide. Warning, though: it involves some luck. Exotics are unique, named pieces of equipment you can find throughout The Division 2. They have unique abilities that make them preferable to a lot of standard gear, but the trade-off is that they can be incredibly difficult to find. Merciless is a standard, single-fire Rifle, and getting it comes down to just dumb luck. There are a few ways to tip the balance in your favour, though, and it’s a great and versatile weapon for Sharpshooters and Demolitionists. The Merciless rifle's main talent is Guerrilla Warfare, which can be very disorientating for first-time users. On pressing down the fire button, a primer will be fired. This does normal damage, but it remains in the enemy for when you release. Releasing fire then sends a detonator, which, if it hits the same enemy, will then detonate the first charge for approximately 40,000 damage. Charges can be stacked up for massive damage, with each primer gaining 75% extra damage per primer when detonated. Landing a hit with a detonator will trigger multiple charges on the same enemy at once, so stack them up by intentionally missing every other shot until the maximum of five charges are on the enemy. Then detonate them with the tenth shot (the release of your fifth click) to deal almost 600,000 explosive damage at once. Combine this with the Demolitionist’s explosive damage buffs and you’re looking at way more. For Guerrilla Warfare to work, there is a second talent called Binary Trigger. If you pre-ordered the game, you may already be aware of it as it’s included on the pre-order exclusive Ruthless rifle. It’s kind of useless with Ruthless, but the combination of Binary Trigger and Guerrilla Warfare make it deadly for the Merciless. The final talent is Brutality, which, when holstered, gives a 5% chance for your other weapons to deal an extra 20% explosive damage on top of their normal output. This is also buffed by the Demolitionist’s perks, meaning high rate-of-fire weapons like an LMG can become explosive powerhouses when combined with the Merciless. Acquiring Merciless isn’t as much of a slog as The Lost Chatterbox, but it still requires an astounding amount of luck. To get it, you have to kill named Hyena bosses. It can be on any difficulty, although higher ones appear to have higher drop rates for it, so at the very least you should stick with Hard difficulty. You’ll know when it drops, because instead of a yellow light loot highlighter, it’ll be a tall pillar of orange with the SHD insignia at the top. You can’t miss it. Bounties are good way to farm for the Merciless while keeping things fresh, although the Hyena bounties will quickly dry up and you’ll then have to start grinding out missions. The community has adopted the Jefferson Trade Center mission on hard as the accepted grind location, so you’ll be able to quickly matchmake for there, although any mission with named Hyena enemies (Federal Bank, Grand Washington Hotel and Union District Arena) will work. When you get it is just luck of the draw. Some people get it on their first try, others on their 50th (mine was around the 25-30 point). Seeing as it can drop multiple times, it’s worth playing with friends who already have it and are willing to swap it to you should they get it again, as that effectively quadruples your chances of getting one. Getting a hold of the Merciless should be the main goal for any Demolitionist, as its raw explosive damage output works fantastically with their talents. It just takes a lot of time, a lot of disappointment, and a burning hatred for any named Hyena boss who doesn’t drop it after the 20th time you kill them that day. Or, you might be one of those lucky few who get it first time and the rest of us who toiled for it will secretly envy. Either way, good luck.